Acrylic worktops have been around for over 30 years and have been regularly used in commercial applications. Now this high quality alternative has become popular in residential homes. The most attractive feature of Infinity is the ability to join pieces together seamlessly, providing the appearance of your worktop being carved from one piece. These Waterfall ends give a modern continuous design without highly visible joins. Undermount sinks can easily be integrated into the worktop as well. Infinity Worktops are completely repairable and renewable, offering peace of mind that you can easily restore it to its new original condition. A simple sand and polish is all that is needed to have your kitchen worktop looking good as new. Quadra worktops offer the best quality laminate worktops at unbeatable prices. Sourced from the world's most environmentally responsible manufacturer, Amorini New Zealand is proud to offer Duropal high pressure laminate worktops to our customers. Despatched two working days from order online. Quadra worktops have 3mm tight formed radius, square edge. Quadra worktops are 39mm thick. Quadra worktops have built in polyurethane drip edge. 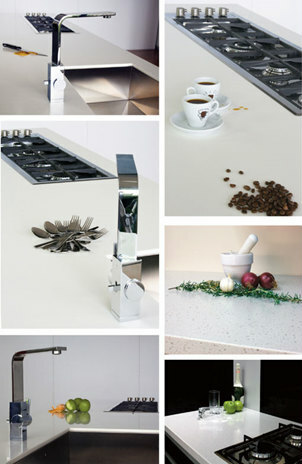 Quadra worktops are resistant to reasonable heat. Quadra worktops are resistant to stains from everyday use. Copyright © 2014 Amorini - All Rights Reserved.